Today the FlagRunners ran to Lake Park Memorial in Des Plains, IL. Not only was it beautiful, but the freshly cut holiday Christmas trees gave off a wonderful aroma. 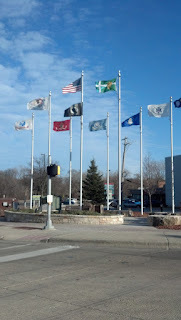 Flags are a great way to mark the spot for a community park. Visitors can come pick up a tree and take a moment to recognize the memorial erected for Veterans in their community. 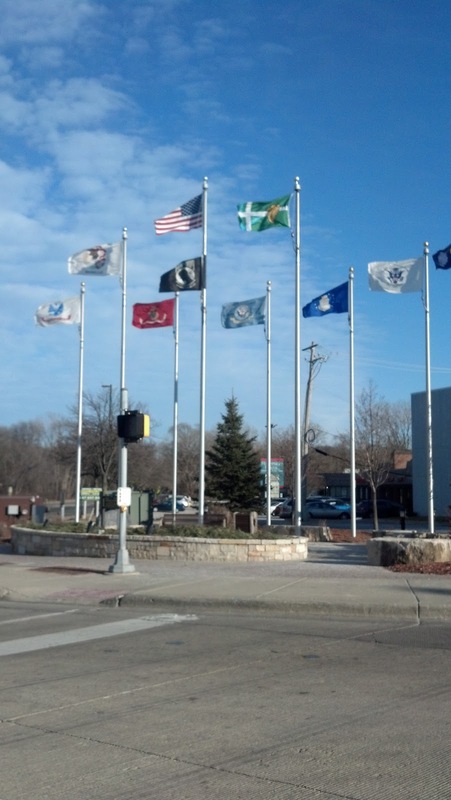 Lake Park Memorial, like many memorials around the country features our military branches (Air Force, Army, Coast Guard, Marine Corps, and Navy) as well as the American flag. This display also has a POW/MIA flag, honoring prisoners of war and those missing in action. From reading the plaques, it is clear this memorial took a community effort. Running from flagpole to flagpole across the country, we as FlagRunners always love it when we see memorials and veterans displays because of the thought put into them. These memorials are typically found where there is a lot of natural traffic. In this example, the display is the centerpiece of this magnificent, several acre park. In other cases, we find memorials along heavy intersecting highways. Here is an example of a display found along the Blue Star Memorial By-Way. There may not be a lot of foot traffic in this area, but plenty of cars get a chance to take a moment for our military and community. This is right across the corner from Friendship Park. This is a great little spot for the local business offices. You can find examples of community projects all over Wheeling, Des Plains, Rosemont, and the other villages of Northwest Chicago, along the Des Plains River Trail or DPRT. FlagRunners are getting ready to show you just how amazing this community and backyard is!